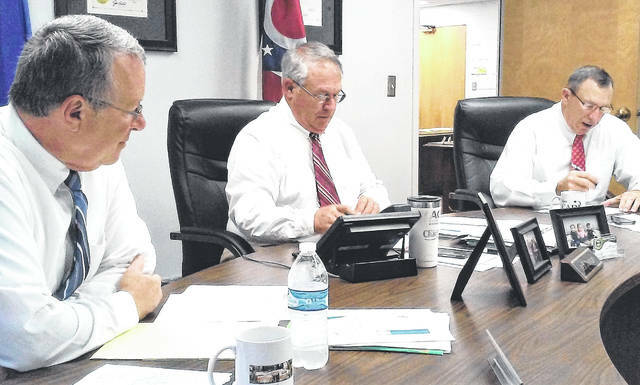 Highland County Commissioners, from left, Gary Abernathy, Jeff Duncan and Terry Britton, are pictured during Wednesday’s meeting agreeing to let a Department of Justice grant application deadline expire for the Rocky Fork Lake area. The Highland County Board of Commissioners announced at their Wednesday morning meeting that they will pursue a local plan to increase law enforcement and clean up blighted properties in the Rocky Fork Lake region, while at the same time withdrawing their request for a 12-month extension for a Department of Justice grant that has been unresolved for the past two years. With an end of the month deadline looming, county commissioners blamed a lack of cooperation from the Department of Justice and government red tape for their decision to withdraw from the project. “At this point, due to the apparent staffing requirements it would take, we’re just not equipped to handle all of the requirements and paperwork they’re handing out to us to continue to move forward with the grant,” Commissioner Jeff Duncan said. He reiterated that although commissioners are allowing the grant to expire, it in no way diminishes their commitment to the continued improvement and growth of the Rocky Fork Lake region. “We feel like in the process of securing this grant that there have been a lot of improvements in the lake region that came directly from our efforts to secure it in the first place,” Duncan said. Two years ago, according to a Wednesday news release to from the commissioners, the DOJ’s Bureau of Justice Assistance announced the awarding of moe than $800,000 for a two-year project, with an implementation period of September 2016 to September 2018. However, the BJA almost immediately began to identify problems with the project proposal, primarily questioning the creation of a land bank, and the fact that the project leader/fiscal agent – Turning Point — was not an employee of the county. Another big question the BJA had centered on whether sufficient staffing was in place to administer and oversee the grant. When these objections surfaced, the county commissioners immediately froze the expenditure of any further grant dollars out of concern that they may have to be returned to the BJA. In the early stages of the grant’s implementation, Duncan pointed out the increased presence of law enforcement and the health department efforts at cleaning up various issues, and also noted other enhancements coming to the region that he feels are a direct result of working on the grant. He added that commissioners have a meeting scheduled for next week with members from an adjoining county to discuss the implementation and operation of their land bank. Duncan said the land bank is a necessary part of the cleanup of properties at the lake and other areas of the county. During last weekends’ Smokin’ in the Hills event, Duncan and fellow commissioner Gary Abernathy said they spoke with people from Rocky Fork Lake Alliance, with Abernathy expressing gratitude at their depth of understanding of the grant’s complications. In July of this year, the news release said, commissioners revised the grant budget to focus more resources directly on crime fighting and blight remediation. More than two months later, commissioners have still not received a decision on whether the 12-month extension would be approved. Even if approved, the 12-month implementation period would result in uncertainty about sustainability once the 12 months expired. Commissioners said they will meet with Highland County Sheriff Donnie Barrera and Highland County Health Commissioner Jared Warner to devise plans to allow the goals of law enforcement and blight removal to be accomplished without the grant. “All three of us agree that Rocky Fork is vitally important, and we’re going to tackle this anyway, especially with crime fighting and blight remediation, and I think we can do it better with local control rather than trying to please a federal agency that never seems to be pleased,” Abernathy said. Commissioner Terry Britton said concern that if the 12-month extension were granted, programs would have ended just as they were getting started and gaining momentum. Britton echoed his fellow commissioner’s commitment to the region, saying he felt a better job could be done if it is managed locally. “The things that we’ve learned, such as the economic development programs that have come out of this, gave us an idea of some positive things going on out at the lake, plus we’ve built relationships along the way, especially with ODNR and the other entities we’ve worked with, so I think we’re already moving forward,” Britton said. In their news release, commissioners agreed that Rocky Fork Lake deserved more attention to fighting theft, vandalism and illegal drugs, as well as cleaning up blighted properties. In consultation with the sheriff and the health commissioner, they said they would tackle these issues without the limitations and reporting burdens that would accompany the federal grant. https://www.timesgazette.com/wp-content/uploads/sites/33/2018/09/web1_Commish-26-September.jpgHighland County Commissioners, from left, Gary Abernathy, Jeff Duncan and Terry Britton, are pictured during Wednesday’s meeting agreeing to let a Department of Justice grant application deadline expire for the Rocky Fork Lake area.